Get in on it early. Call it a trend tailor-made for commitment-phobes: Whether you don’t want to take the plunge into a fully chromatic space or just can’t decide between two colors, two-tone design is a lifesaver. You’ve probably seen two-tone walls on your feed—think, rooms divided by two hues neatly down the middle for contrast or even color-blocked bathrooms. The style is instantly eye-catching and creates an even bolder statement than a vibrant singular hue. We first started seeing two-tone emerge as a paint trend in early 2018. In living rooms, in bedrooms, in bathrooms… the style was everywhere. And while painting a room with two colors is really just a matter of patience and skill, it can seem intimidating. Especially for the DIY-averse among us. Thankfully, two-tone decor is a more manageable—not to mention, budget-friendly—way to dip your toe into tonal design. So instead, here are some smaller ways to incorporate the two-tone style at home. From your kitchen to your sofa, there are plenty of ways to try your hand at this striking color trend. 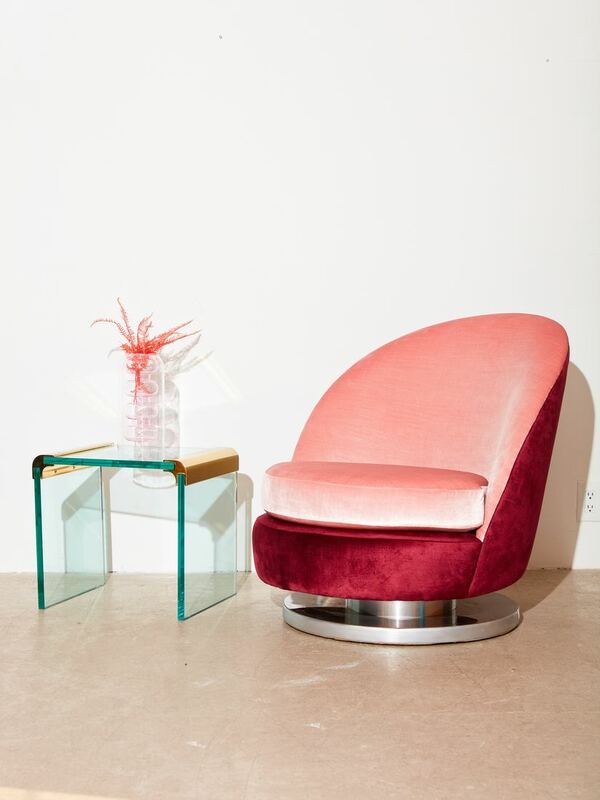 The ’70s called, and they want to deliver this swivel chair to your living room. A gorgeous blend of the ever-trendy Millennial Pink and deep berry—one of the trendiest hues of the moment, by the way—it’s a surefire way to make a statement in any reading nook, office, or bedroom corner. Go green. Not only is a refillable soap bottle a more eco-friendly solution for your liquid hand soap, but the dusky mint hue will imbue even the tiniest of rental sinks with some much-needed visual interest. If your sofa is in need of a refresh, it might be as simple as new throw pillows. This tonal blue pick was handwoven in Ethiopia and made from natural dyes—a quality piece that comes with a unique backstory. You might not be able to do much to elevate your rental bathroom, but upgrading your shower curtain is probably the easiest way to make a splash on a budget. We’ve long espoused the virtues of Quiet Town’s multicolored curtain offerings, and the two-tone cream and terra-cotta option is one of our favorite colorways. Maximalists, we found your dream vase. The simple silhouette allows the bold color choices to really shine—pair with an equally vibrant array of flowers for an easy centerpiece or mantel addition. If you’re trying to beat S.A.D this winter, this glass piece is a great way to start. If your dining room table situation is less of a “dining room table” and more of a “small bistro seating in the kitchen corner,” upgrade your chairs. It’s an easy way to elevate even the most informal of settings. The warm coral and yellow hues of this one will brighten any breakfast nook. Add a pop of pink to your bookshelf with this tiny ceramic vase. It calls for shorter-stemmed flowers—try your hand at the dried floral trend—or greenery. Think of it as a more digestible way to get in on Pantone’s color of the year than painting your home in “Living Coral”. Maybe you want to try your hand at two-tone decor but aren’t ready to surrender your monochrome minimalist aesthetic. That’s okay. It’s why this greyscale placemat exists: The perfect way to add minimal pattern and texture to your tablescape without going overboard.